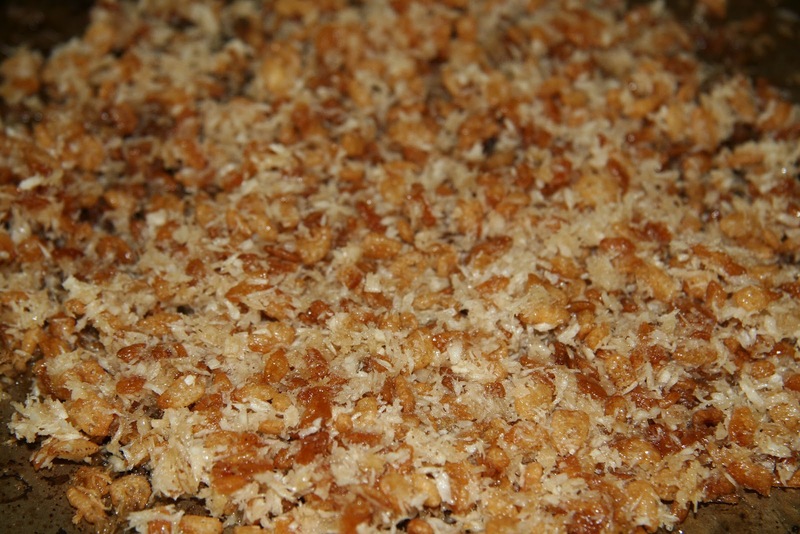 Combine the coconut milk, sugar, and vanilla extract. Refrigerator for at least 2 hours. Peel and chop the mango into small chunks. Add to the processor with water and puree. 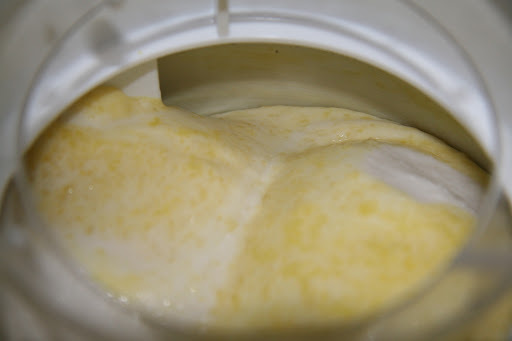 Pour the coconut milk mixture into the ice cream maker and churn for 20 minutes. With five minutes left, add the mango puree. When combined, place into a freezer safe container and freeze. Cut the beets from the stems. Peel beets and cut into quarters. Place in pot with water and boil until you can pierce with a fork. 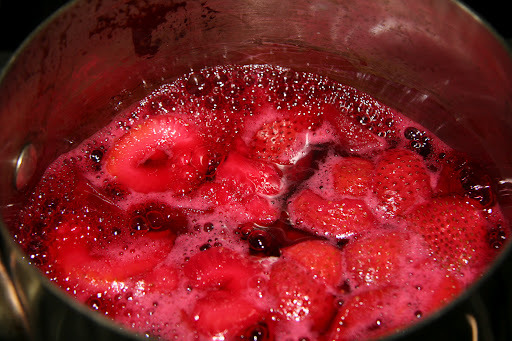 Add strawberries, sugar, and salt and cook down for another five minutes. Cover and let cool. For this sauce, pour mixture through the Foley Mill and “foley” until you have nothing left. Then drain what is in the bowl through a very small mesh strainer so the sauce is perfectly perfect. Refrigerate until completely cool. Mix all ingredients. Spread out flat on baking sheet. Bake for 15 minutes and cool completely. When cool, break apart into pieces. 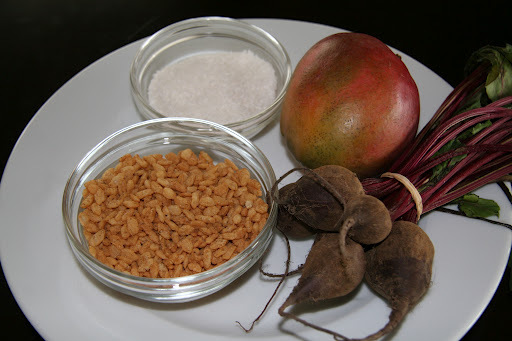 To assemble the dessert, place the strawberry red beet sauce on the bottom of a shallow bowl. 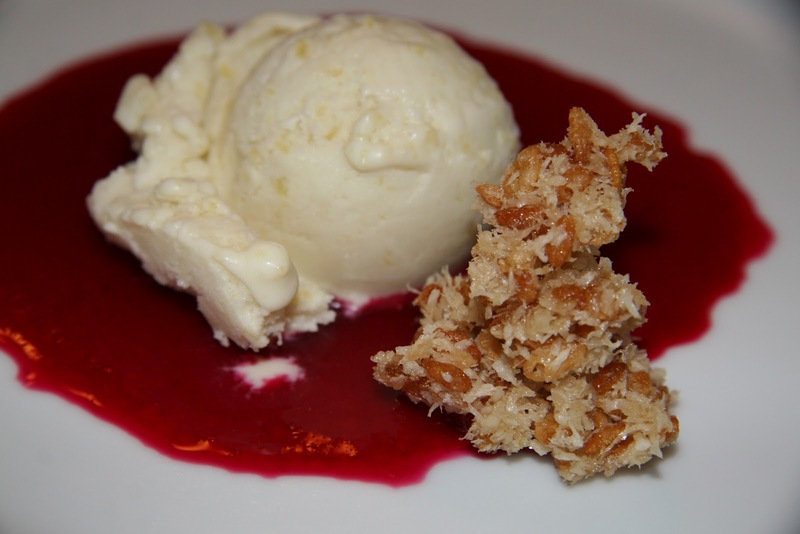 Add a scoop of the ice cream and garnish with a little pile of the crunch. Enjoy!